Creator Patricia Wilsher Bunting tells us a “glaze” style sauce is exactly how she envisioned it to be. Heat: – The natural heat from the Datil peppers has been cut back with the other ingredients. This is a mild – medium sauce. Overall: – We wish is was a thicker sauce. Ingredients: Distilled vinegar, tomato concentrate (sugar, vinegar, salt, onion powder, spice, natural flavors), orange peel concentrate (high fructose corn syrup, orange peel, orange juice from concentrate, sugar, citric acid, pectin, potassium citrate), brown sugar (white sugar with molasses), mustard (water, mustard seed, vinegar, salt, white wine), honey, fresh Datil peppers, lime juice from concentrate, lemon zest and spices. Texture & Appearance: This bright red sauce is indeed very thin. Great for dipping into, or drizzling onto foods. Useful. Taste Straight Up: A huge Datil pepper flavor is first and foremost. The sweetness from the sugars and citrus comes in next. Sweet and delicious. Heat Level: Datil peppers can be hot amongst themselves, but this sauce tempers the heat enough for it to be enjoyable. Mild-medium. Label/Graphics: Simplistic graphics. I find these to be friendly and inviting, and somewhat mysterious… you never know what you’re going to get when the label is cartoon-y. Friendly. 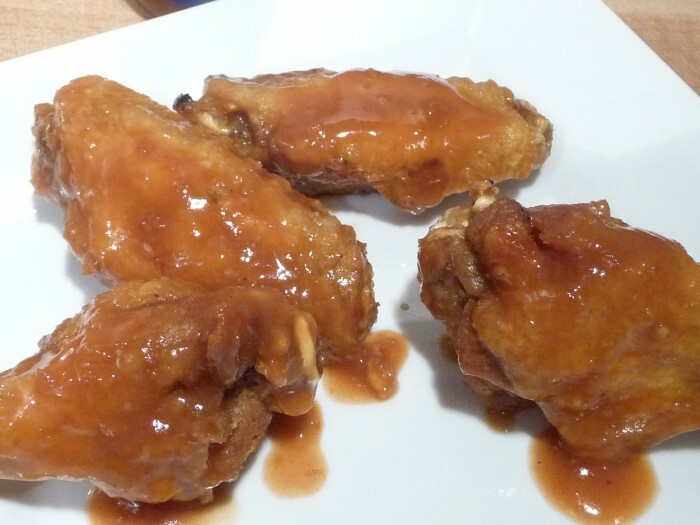 We cooked up some crispy wings to try with this sauce. 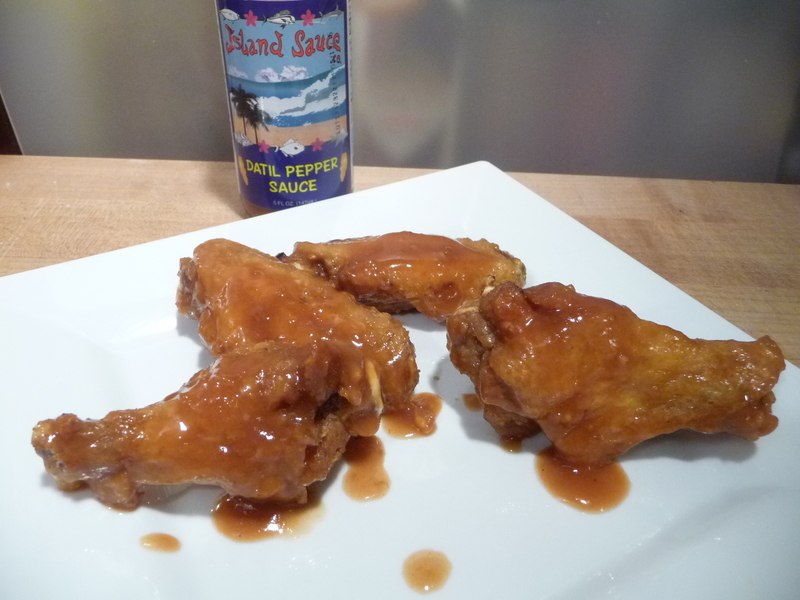 Deep fried wings using our Wings 101 recipe were tossed with the Island Sauce Company’s Datil Pepper Sauce. They came out hot and spicy with some great Datil pepper flavor! 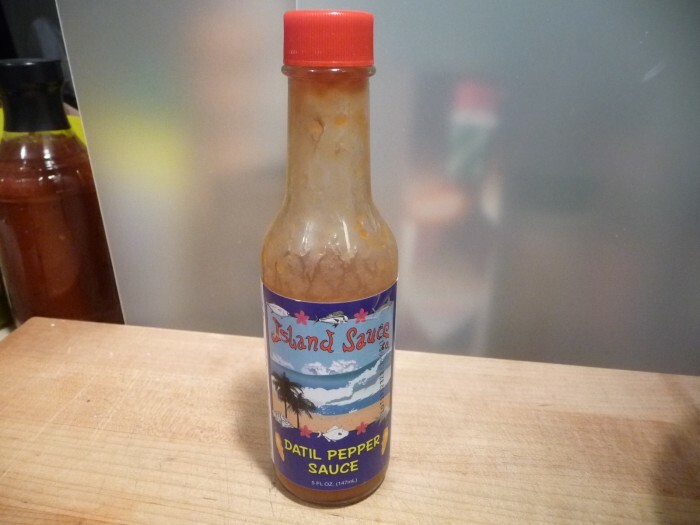 We liked this sauce enough to purchase 2 more bottles along with their Smokin’ Mango Sauce. 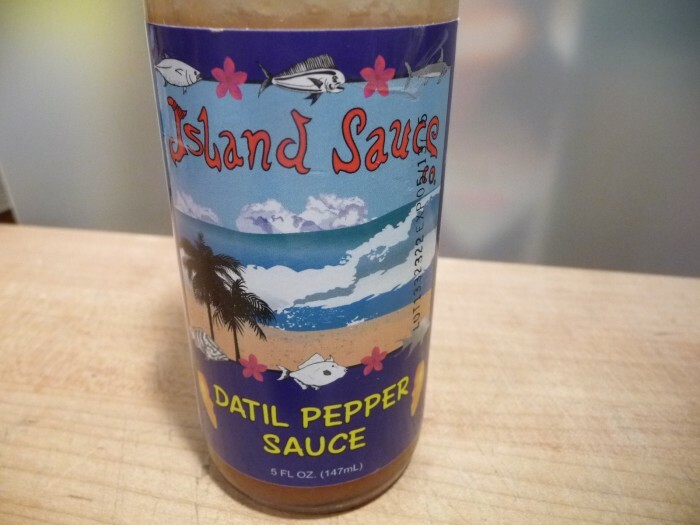 If you’ve never tried a Datil Pepper sauce, this is a great one to start with. Big flavor, nice heat, and quality ingredients are good reasons to go with Island Sauce Company’s Datil Pepper Sauce. Social Media: Follow and like Island Sauce Company on Facebook. Island Sauce Company began from a love of cooking and enjoying good sauces. We are from North Florida where Datils are the local pepper. Datil peppers have a rich and distinct flavor not just heat like other peppers. The Datil pepper flavor is unique. Pepper lovers must try it! Tell Patty that HotSauceDaily sent you! Are you a fan of Datil Pepper Sauces? Not many people know about this great pepper that is native to Florida. We’d love to hear from you – your favorite Datil sauces? Recipes? It’s back to a sauce review on wings today with Datil Dew Inferno Sauce from PepperProducts.com. Don’t let the “Inferno” name scare you. This is Week of Wings 6 – Day 4. 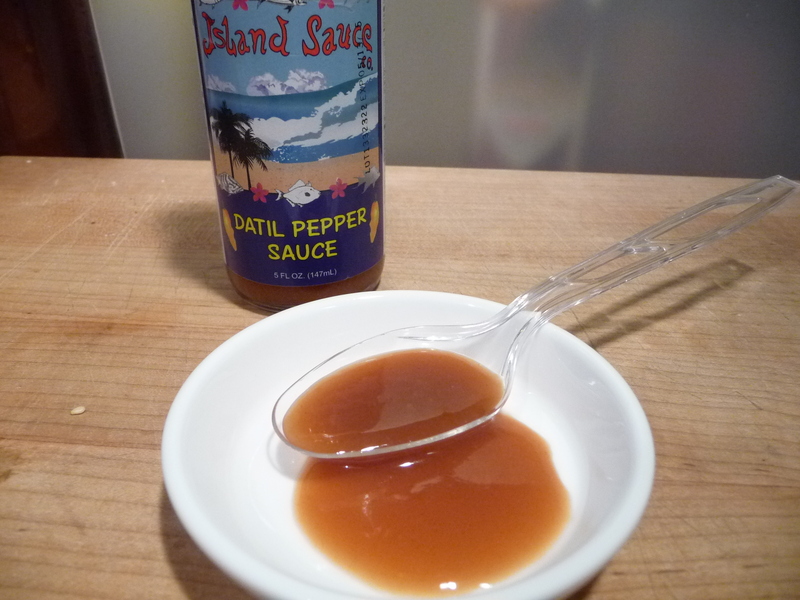 We love Datil pepper based sauces here at HotSauceDaily.com. Whether it’s a BBQ sauce, a dry rub, or in this case a sauce that defies description… if it showcases the Datil pepper from St. Augustine Florida, we are all in. Wanda and Byron Bates have built PepperProducts.com to showcase their many sauces and pickles, all based around the Datil pepper. Ingredients: Tomato paste, corn syrup, vinegar, salt, onion powder, spice and natural flavors, water, brown sugar, red wine vinegar, Datil and habanero peppers, garlic and salt. I mentioned earlier to not let the “Inferno” name scare you away – and now I will mention that #7 on the bottle is also a bit over-stated. This sauce is not a 7 out of 10 in heat. I’m not sure why they have a #7 on the label. 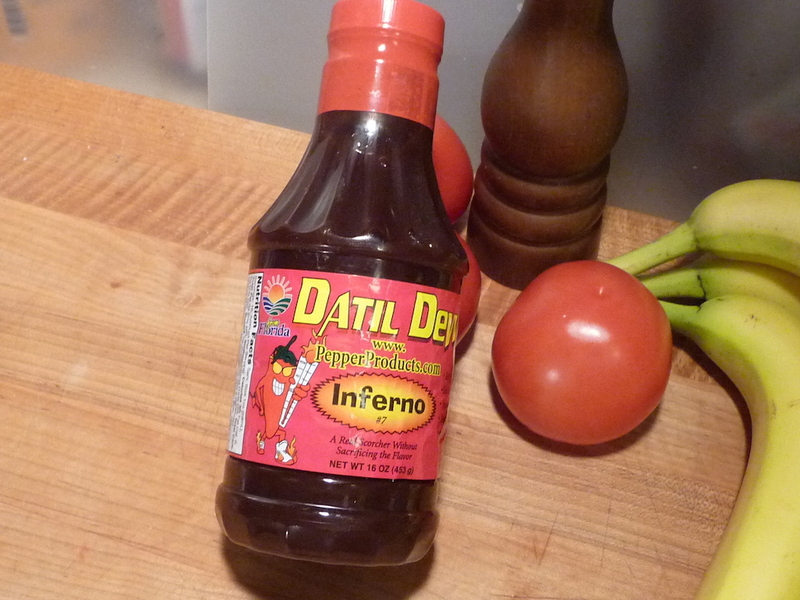 Datil Dew Inferno sauce is dark mahogany colored with a light-medium consistency. Heat Level: – Spicy, hot, sweet, heat. We cooked up some wings using our standard bake and deep-fry method (Wings 101). 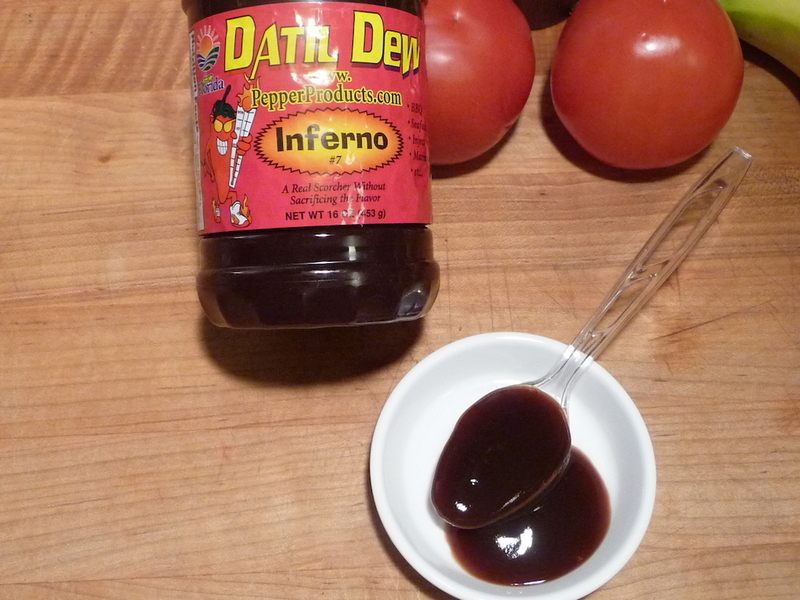 We then tossed them into the Datil Dew Inferno sauce, and for the pretty pictures, we painted on even more sauce! 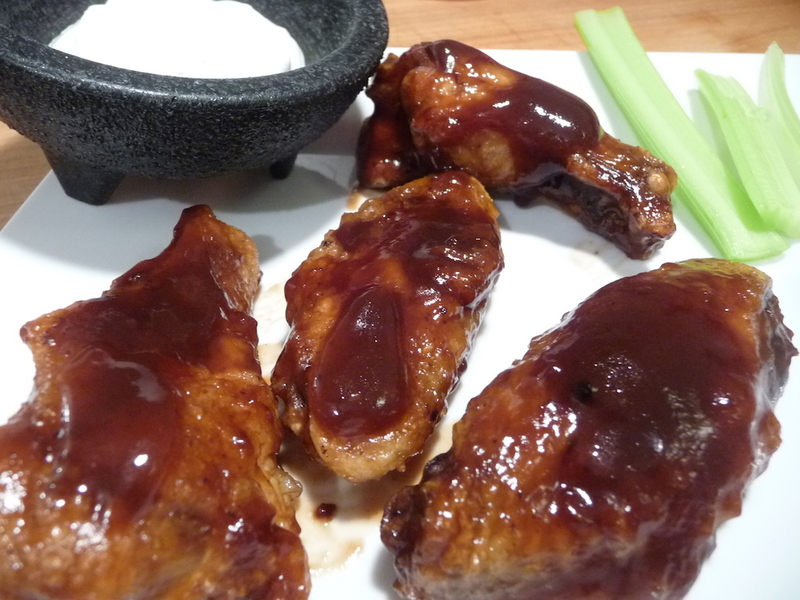 Hot wings glazed with Datil Dew Inferno then brushed with more sauce. Overall Rating: – Delicious and easily a repeat sauce. Great Datil based glaze. 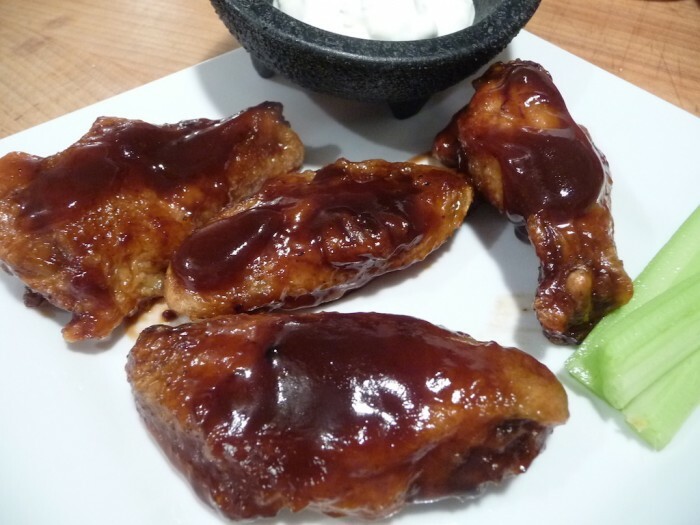 Both Marilyn and I thought this sauce is a great glaze on wings with the sweet and fragrant Datil pepper profile. Extra sauce is always good.